Little (Suzette) and Lion (Lionel) are stepsiblings in an interracial family. They were interreligious, but Suzette and her mom converted to Judaism when Suzette was eleven. She's 16 now and returning to LA from her first year at boarding school, where she was sent while Lion and the rest of the fam could adjust to Lionel's diagnosis with bipolar disorder. 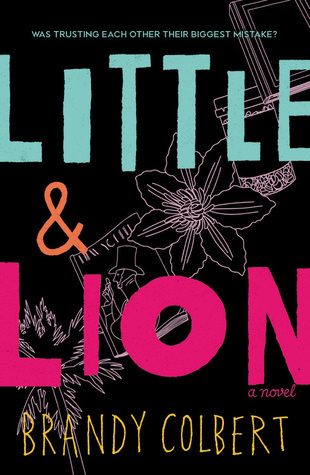 It's hard for Little and Lion to reconnect when Little returns, even though they had been close friends and, a year apart in age, had shared a circle of friends, as well. Lion missed a lot of school and self-isolated. Suzette kept in touch with her best friend Dee and disclosed her affair with her roommate Iris. DeeDee had been out as a lesbian since she was a child, but Suzette doesn't know what her sexuality is yet. Is she homo- and Irissexual? The story becomes something of a bisexual dilemma when Suzette crushes simultaneously on a boy (longtime friend Emil Choi and a new girl she meets at DeeDee's). I found the Emil or Rafaela storyline a little tedious and wondered about Iris. The other relationships and characters are more compelling, though. Lion's frustration with how his meds make him feel (or not feel), Dee's interest in nonmonogamy, etc. Some (many?) of the characters feel a little too perfect, though, like the parents: Saul and Nadine, Emil, and Iris. The friend who passed L&L on to me loved it like crazy, and I loved Colbert's previous book Pointe like crazy, so maybe I expected too much.